A North Carolina water and sewer authority initially purchased a Godwin HL10M Dri-Prime pump for a temporary bypass needed at its wastewater treatment plant. Taking advantage of the flexibility offered by the Dri-Prime pump, engineers at the authority then utilized the HL10M pump for six weeks to provide supplementary pumping during the installation of permanent pump upgrades. The HL10M also was used at the authority's raw water pumping facility as a contingency during power outages. 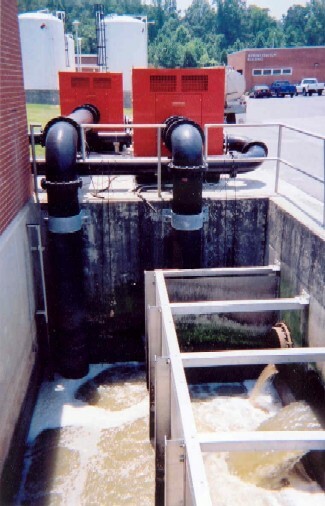 In a separated application, two Godwin 12-inch DPC300 Dri-Prime pumps were used at the authority's treatment facility. Designed as critically silenced units, the 12-inch pumps solved the challenge of providing enough capacity to meet peak demands until a major system upgrade could be completed. As permanently installed pumps at the station were taken off line and upgraded, the DPC300 Dri-Prime pumps provided supplemental pumping capacity during high flow conditions. The customer was impressed with the reliability of the equipment as well as the service. As a result, they asked Godwin Pumps representatives to advise on a contingency plan to deal with the impact of coastal storms and hurricanes. Godwin now has contingency plans in place at seven of the authority's pump stations.